After the initial bubble of excitement, Google Glass was ultimately rejected by the public and sent back to the drawing board, all for one simple reason: Despite repeated attempts to tone down the design of Glass and make it more familiar, it remained an alien thing to see on someone's face. Add in privacy concerns stemming from that camera and a lack of a clear use case and it's no surprise that the idea of face-worn wearables took a major hit. The optics experts at Carl Zeiss think they have what it takes to bring the category back. As you might expect from a company that designs glass lenses, Zeiss isn't worrying about the computer hardware, displays or software that might run on a future pair of smart glasses. 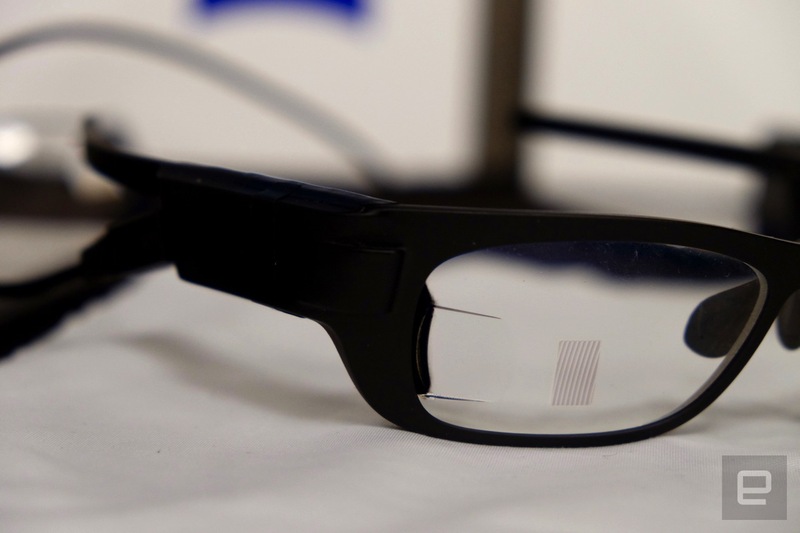 Instead, the company has figured out a way to project a heads-up display onto a curved lens. Unlike Google Glass, the result will ultimately look near-identical to a standard pair of glasses. If you look close, you'll see subtle variations in the lens, much like bifocals, but it's far less noticeable than the large module that made Google Glass look both futuristic and bizarre. The system from Carl Zeiss breaks down like this: The battery, processor and other guts of the smart glasses are packed into the "arm" of the prototype glasses. That's all wired into a tiny OLED display near where the arm meets the glass lens; the images on that display are then projected through a polycarbonate/mirror "light path" attached to the edge of the lens that functions like a much more complicated prism. The display ends up appearing onto a "fresnel structure" that's placed on the lens. That area is technically a second, extremely thin lens that is where you'll look to see what the OLED is displaying. It'll likely be placed somewhere to the side of your direct field of vision, but it can theoretically go anywhere on the curved lens a designer chooses. I got to check this all out in large-scale demo devices as well as a prototype put into a pair of glasses. 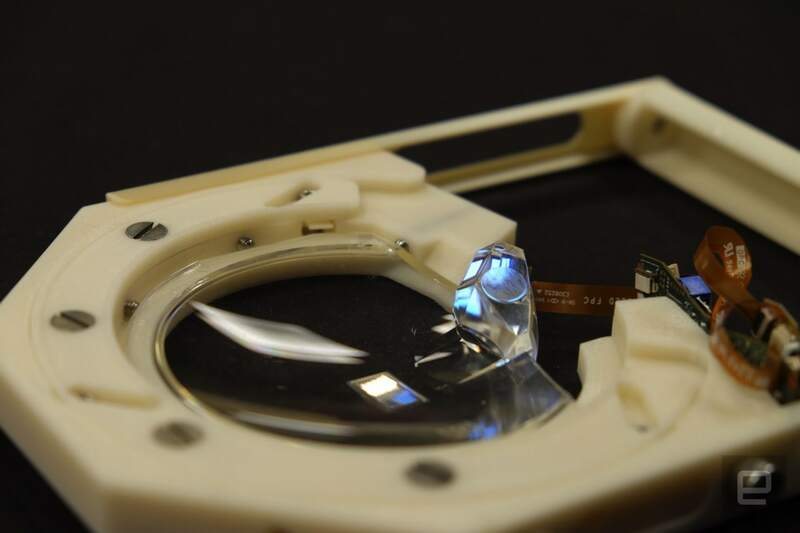 The upshot of all this complicated engineering is that you can project images from a tiny screen onto a curved glass lens -- and that's exactly what we'll need if we want a glasses-style wearable to work. Using curved glass was a tremendous technical challenge, but it means that you can manufacture lenses that can go into standard glasses and apply prescriptions to those lenses. The goal is to make a wearable that you could actually wear all day long and just look like someone wearing a normal pair of glasses. Of course, the prototype I tried on -- a clunky device that had to be hooked up to a battery pack to function -- isn't close to there yet. But Carl Zeiss isn't worried about battery life or making electronics that are small enough to fit seamlessly on a frame. The company's sole purpose is to develop these curved lenses and then partner with a technology company that can develop the computing hardware and software. And the act of looking through the fresnel at the content was incredibly simple and can be placed exactly where you might want it. Sure, I was just looking at placeholder content, but the idea is sound and the execution was pretty solid for a prototype. Put simply, if someone has a good idea for smart glasses, this Carl Zeiss lens solution may soon be the most elegant way to implement it. The company is currently scaling up its manufacturing capabilities -- beyond simply being able to develop the lens, the company also had to make sure it could be made at in large scale quantities without it being prohibitively expensive. The next step is finding hardware partners who will use Carl Zeiss's new innovation in its products. We may not have seen any new smart glasses at CES this year, but by the time CES 2017 rolls around, we could see this new lens technology in action.